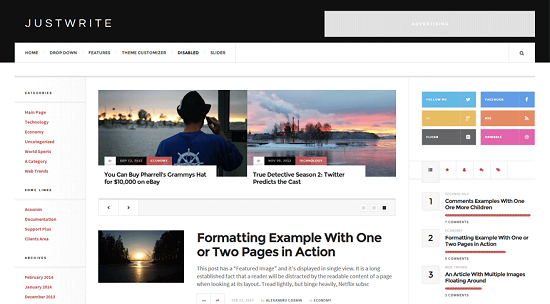 WordPress template free, responsive | WordPress is a free platform for blogging. The largest self-hosted blogging tool in the world. Over millions of users use WordPress for host their blog. So today I’m going to share WordPress template free responsive. If you going to create a blog or already own a blog and want to change the theme. You are in a right place to choose best free themes like premium WordPress theme but it’s absolutely free. You can see more comments and reviews about free WordPress themes are risky. Because those free themes are designed by beginner designers and they not supported as well. In some stories this is true but not at all. So this is most important for you to choose right free theme to your blog. Some free themes really good at designing but not on SEO and great coding. Some free themes really good at coding but not on SEO great designing. So you want to find a theme that solid codded, SEO friendly and designed very well. However, in some cases free themes are more valuable than a paid theme. That’s what we are going to introduce from this post. If you not like below listed themes. Then consider these feature if these available on that theme you good to go. If not available these feature on that theme think two times before install to your blog. Because it will slow down your site, when WordPress updated their platform your site can broke, losing valuable traffic, SEO losses. So find these features before active WordPress themes. The theme working great on mobile, laptop, desktop and tablets. Customizable front page, blog layouts and blog colors with WordPress theme customizer. Change blog fonts easily (default). If social sharing options available by default it’s good for share your post on social media without getting spam alert. 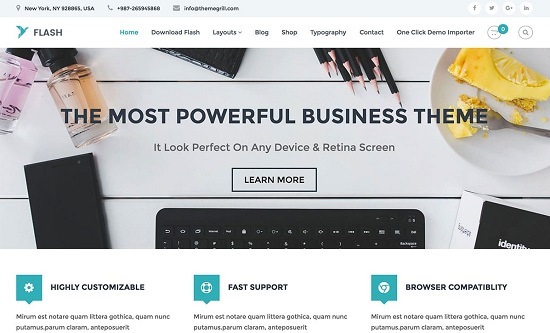 SEO optimized theme. Include schema data’s available. Some free themes regularly update available. They update themes for add new features, fix bugs and stay up to date with the latest version of WordPress. Most internet users use Chrome, Mozila firefox, Opera, Safari, UC browser and internet explorer. So if your theme working fine on Mozila firefox, Opera, Safari and IE9+ browsers then you good to go with it. Most of free and paid themes coded well by expert designers. If your theme coded well then your site will load fast without any error and automatically detect to search engine without error. Most of website facing problem in Google search console with hentry error, site navigation erro and webpage error. These errors will decline your site from search engine. So find a theme that well coded. Get a theme with live support offered. Its ok when forum support available. Most free themes offer forum support exclude some 3rd party free themes. Recently WordPress team started a new work that is WordPress Best practice (Teach how to coding well). Some theme makers follow WordPress coding best practice. So all themes reviewed by WordPress.org theme review team. Flash theme is mobile responsive. It designed for business interested in a modern and professional website. But you can use flash for multipurpose. This is a free theme include premium features. Such as, 11 custom widgets, built-in drag and drop page builder and etc. WooCommerce supported. 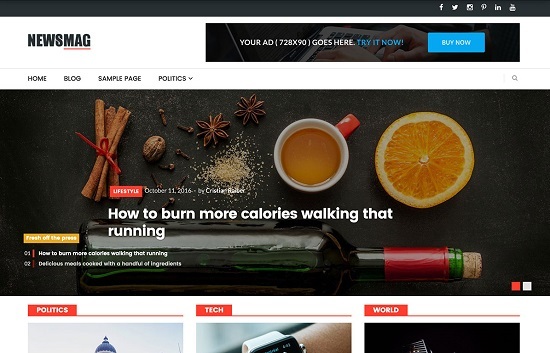 One of the best free Magazine WordPress theme. 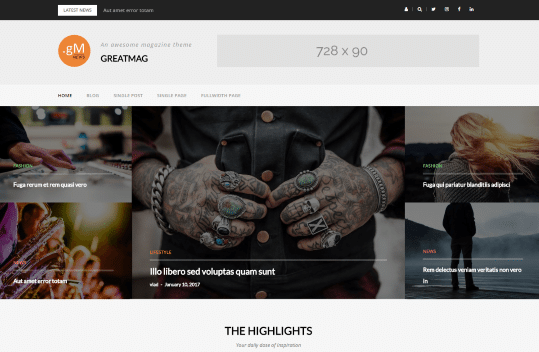 For a free WordPress magazine theme, GreatMag comes with lots of free features. Users can customize theme using theme customizer. 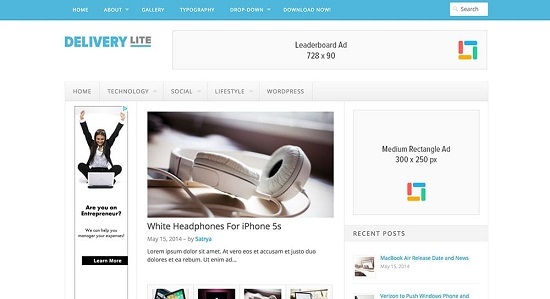 Newsmag Lite free WordPress theme can use for online newspaper or magazine purpose. Main features include Ads ready, SEO ready, Social media buttons, customizable menus and etc. The Hueman theme worked great for many bloggers. I hear about this from many blog readers. Because it loading fast and simple design. So user can easily navigate your blog without getting error or loading problems. User comment section also designed well. So you can make conversions with your blog readers. 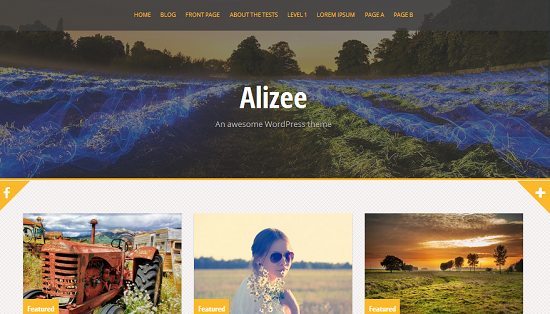 Alizee is a beautiful free WordPress blog theme. You also get two column layout, full width layout custom headers and tons of easy customization options. You can use it for multipurpose. 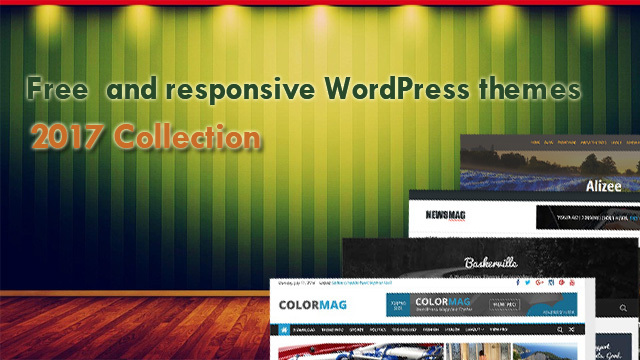 A best list about Wordpress template free responsive wouldn’t be complete without include ColorMag theme. 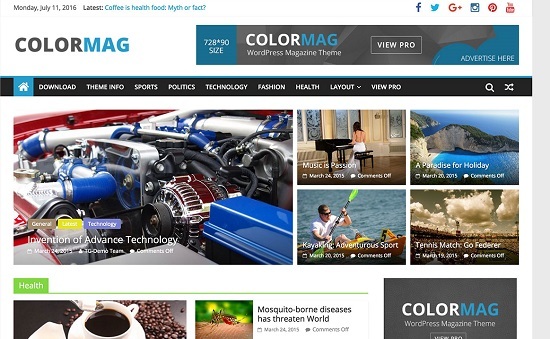 ColorMag is a magazine style free WordPress theme. It featured ads spot, so you can make money form google andsense using your blog. Also you can install WooCommerce plugin. You will not get any problems. Multiple author ready. 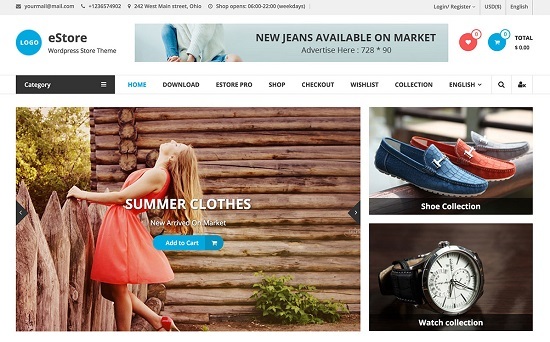 eStore is a premium designed theme offered for free. The Estore best choice for who willing to start their own online store. Membership registration, wocommerce support, Ads spots and beautiful category based front page included. Translation and multi-language also working well on this theme. 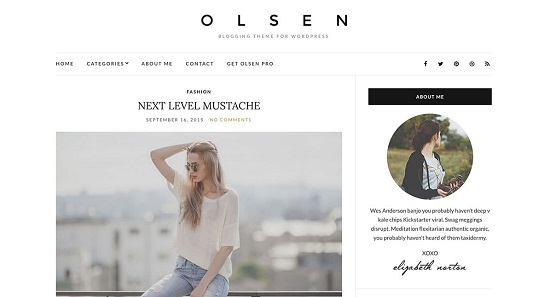 Olsen Light is a blogging theme. Include many features such as social media buttons, customizable menu, and a beautiful location for your Logo. It is more responsive it will help to get more readers to your blog. Loading speed also good. GK Portfolio designed simple. Its look like apple company interface. In this free WordPress theme animations are an option. If you like you can add them. Easy to use interface and load fast. If you are looking for a theme for photography blog. This theme is suit for you. Don’t miss it to use. 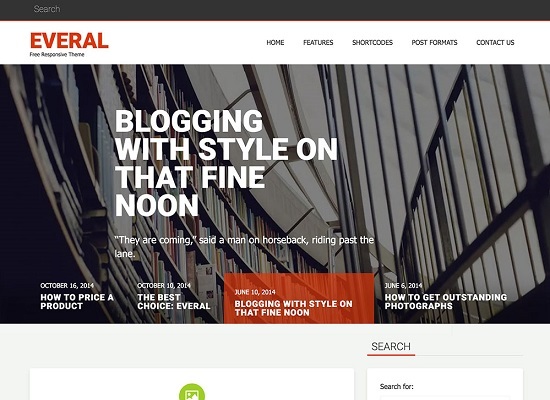 Justwirte is a very beautiful theme for blogging and magazine site. Ton of features available on this theme. Left side bar and right side bar included. Ads ready, so you can make money from sponsor advertising. On the left side bar: categories, links, achieve, and sponsor ad pots available. The theme look very simple and useful. We cannot complete this Wordpress template free responsive article without mention everal theme. Because it look nice and well coded by experts. Big header included. On the side bar search options and recent post widget available by default. You can add more side bar widget form widget option on the WordPress admin panel. Best choice for technology blogs. Simple designing, well coded, fast loading speed and etc. Also leaderboard, side bar ads spot are available. On the side bar recent post widget, category achieve widgets included. Visitors will easily navigate your site. So your page views increase day by day. This is good for your side SEO ranking. If you looking a theme for technology blog. You must try this theme first. that why we added this theme to our Wordpress template free responsive list. 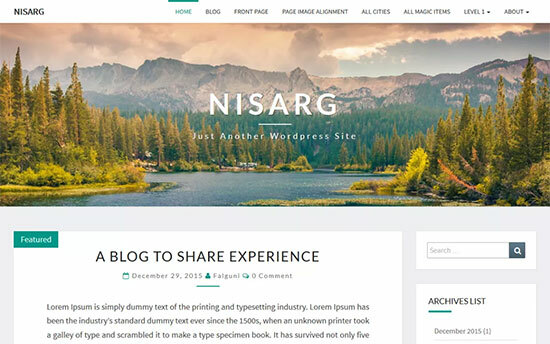 Nisarg one of the best free and responsive WordPress theme. On the nisarg home page a big image make this theme beautiful. The theme design is important because, visitor trust the site if the site looking good and trust. Nisarg designed with 2 navigation menu and a big full size header image. It allows you to easily customize fonts and colors. 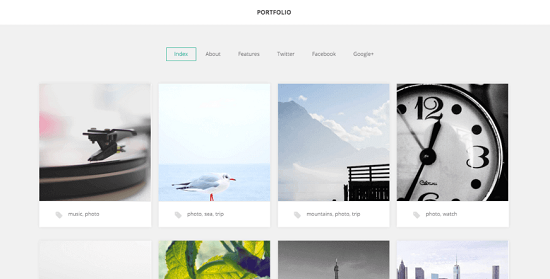 The theme available on WordPress theme library. 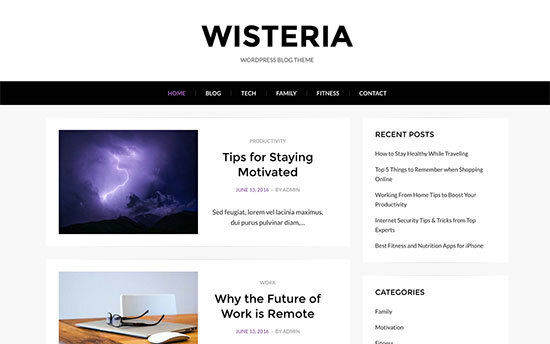 Wisteria is a simple theme with beautiful content and typography. Home page has a good looking. On the side bar category widget and recent post available by default. 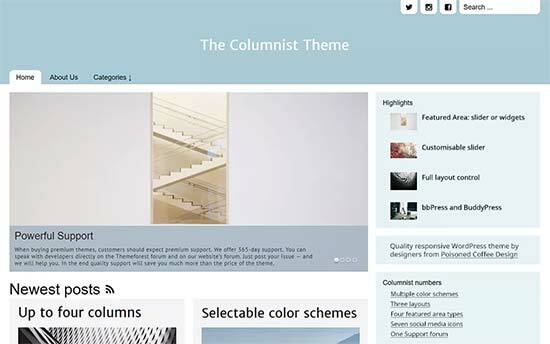 The columnist theme home page has a beautiful responsive customizable slider. Very responsive on most devices. Has different layouts for, archives, homepage single pages, BuddyPress, and bbPress. 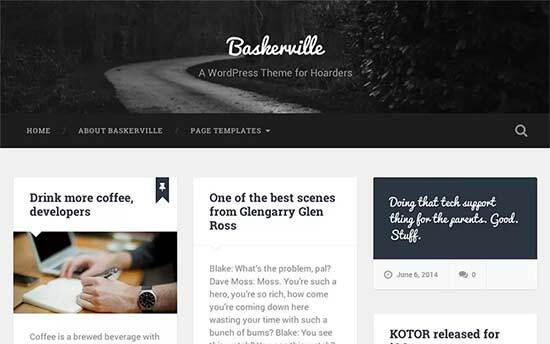 Baskerville is a Wordpress template free responsive. Highly customizable. I see most of popular gaming blogs use Baskerville. I though it is a premium theme. But after researched I found it on some free blogging platform. If you looking for an exactly premium theme. This is available. Try this before buy another. Large header text rocking the themes look. We will update this Wordpress template free responsive list when we got amazing and well designed template. So don't forget to bookmark this Wordpress template free responsive article.